Québec City’s charm is inescapable – not that I’d know, particularly – it’s not as if I tried to escape. Why would you? 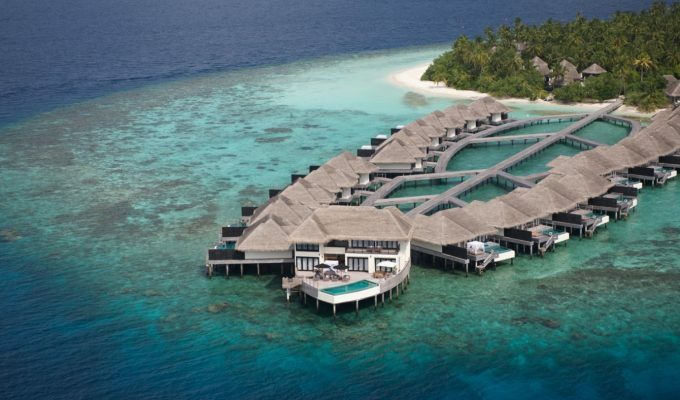 Compact and navigable, its European influences are deftly mixed with its North American location; it’s the closest you can possibly get to France without crossing the Atlantic. Divided into two levels, the Old Town, in the lowers, transports you to another place and time: it’s all winding lanes, a jumble of shopfronts and a patchwork of small squares dotted with quaint churches. The Upper Levels, which can be accessed via funicular if you’re not inclined to take the stairs, are more imposing but no less lovely, with grand edifices and majestic public buildings flanking broader streets. It’s February when we visit, winter time. A Québec City winter is no ordinary winter: it is temperatures that plummet into the double-figure negatives and endless snowfall that piles everything with crystals. There are ice carvings along every street, a mass of lights that twinkle through the dim light of the afternoon. Our visit has coincided with the Winter Carnival and the riverside city, beautiful enough at other times of the year (it’s especially popular in the autumn months for the colours) has been transformed into a white wonderland that actively embraces and celebrates the freeze, rather than merely enduring it. Caribou, the sweet, warm local drink is being served up at ice bars; elsewhere, maple taffy – a confection that involves pouring warmed maple syrup onto blocks of ice and then spiralling it up on to a lolly stick when it starts to harden – is being handed out to adults and children alike. 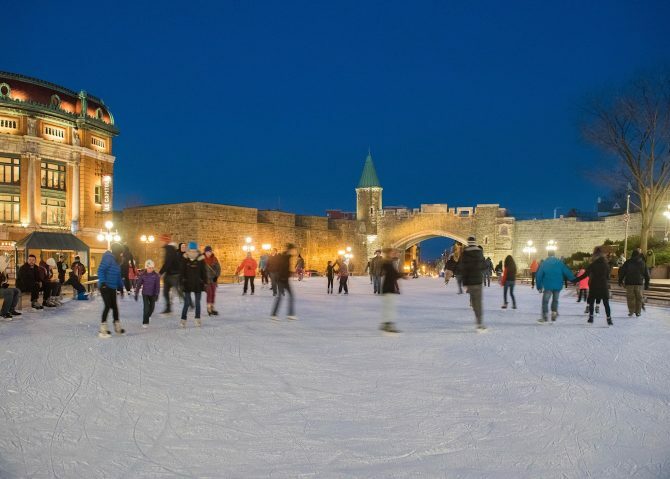 There are also toboggan runs, skating rinks, street food, live music and competitions, not the least of which is the annual Ice Canoe Race, which takes place on the frozen St Lawrence River. As inhospitable as the river looks, with its enormous chunks of ice swiftly moving with its tidal pace, the excitement of the crowd supporting the rowers, plus the sheer adrenaline-fuelled delight of the participants, seem to combine to make the conditions far less unmanageable. Although maybe that’s just the Caribou and my many layers of warm clothing talking! 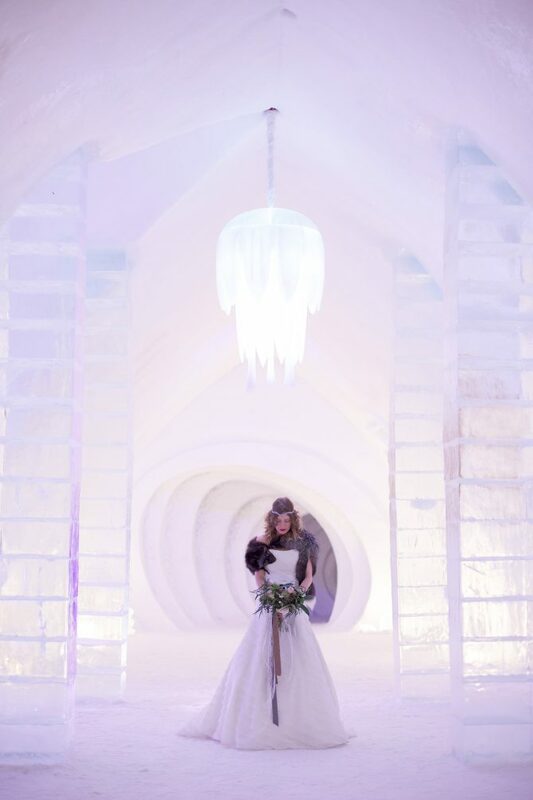 In keeping with the sense of making the most of the cold conditions, the Hôtel de Glace – Ice Hotel – is constructed each year, creating a sparklingly magical setting for weddings. 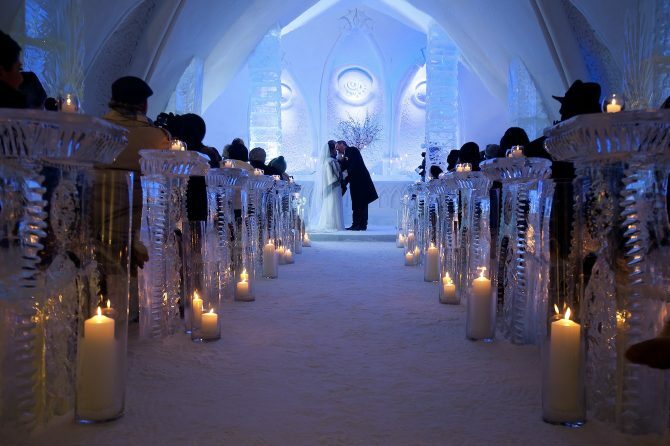 Open between Christmas and the end of March, it’s located about 4 kilometres from the northern end of Québec and made entirely from ice and snow – even down to its dazzling ice chandelier – with 44 rooms and a frozen chapel boasting incredible ice sculptures and fairytale decor. 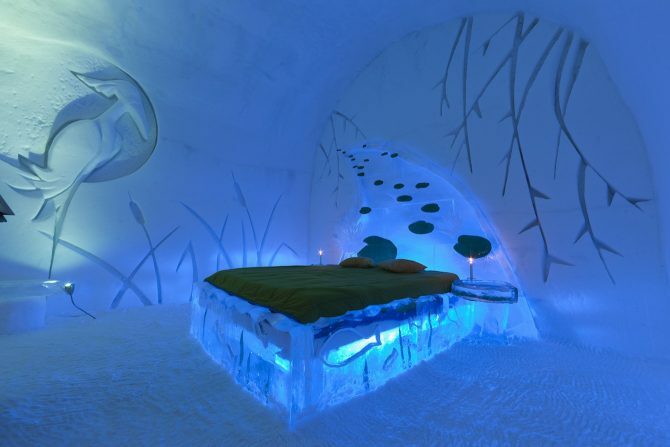 There’s even an ice slide and on-site bars and restaurants, plus outdoor hot tubs and saunas in which to relax with a glass of champagne served in a delicate ice flute. For those wanting to take their vows in a more permanent structure, the beautiful Notre Dame des Victoires church in Place Royale is Québec oldest church (you may recognise it from the final scenes of Catch Me If You Can); alternatively, the majestic Fairmont Le Château Frontenac, proudly situated above the St Lawrence River, has a wealth of “big day” details for couples wanting to make a statement: think dazzling crystal chandeliers, sweeping staircases and venues ranging from the Grand Ballroom to the Salon Rose Room, all steeped in history and elegance. History is very much woven into the offering at Auberge St Antoine, where I am staying: it is as much museum as a hotel. Located in the Old Port area of the city, the site has been, over the years, a merchants’ warehouse and a cannon battery; in excavating the site, the artefacts that were unearthed have been restored and documented, and are displayed throughout the hotel in floating cases. The rooms are sumptuous cocoons, a retreat from the snow heaped against the windows, with deep blue walls and rich gold accents, mood lighting and an electric log fire that leaps to life at the touch of a button. Downstairs, Bar Artefact plies us with a sensational cocktail list, before we move on to dinner at Chez Muffy. 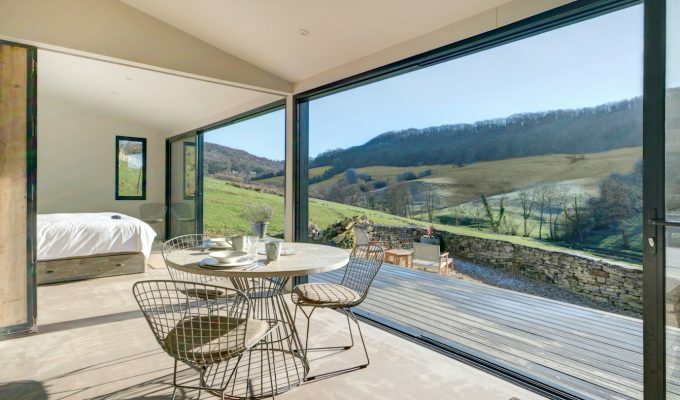 The farm-to-fork experience is a key element of Chez Muffy dining. Housed within original stone walls and wooden beams dating back to 1822, seasonal ingredients are sourced from the hotel’s own farm on l’île d’Orléans, as well as from local farmers and fishermen; the emphasis is on slow cooking to release and enhance the flavours of the food, complemented by 700 different wine labels from 14 different countries. For someone planning a romantic meal – perhaps even a proposal?! – the sommelier team can create bespoke wine pairings – with over 12,000 bottles, many of which are private imports and vins de garde, in the cellar, they have plenty to choose from to meet your tastes and requirements. 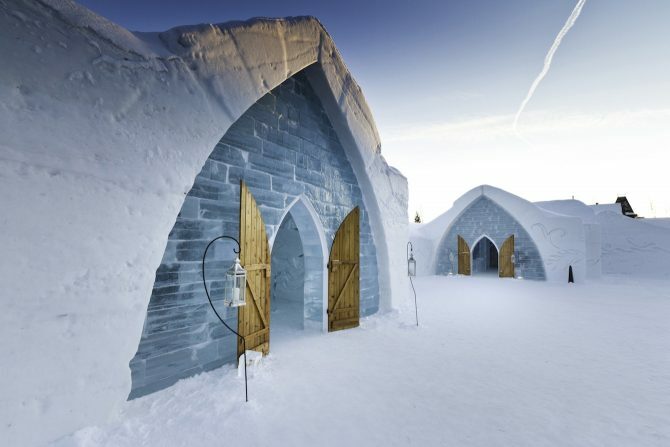 As tempting as it is to while away the days in Québec City, it’s definitely worth making the three-hour drive to Saguenay–Lac-Saint-Jean, where a white wilderness offers endless possibilities for exploring. There are over 3,300 kilometres of marked snowmobile trails, crisscrossing fields and fjords, over which (subject to driver’s licence) you can race joyfully, led by a guide. Or try snowshoeing in Mont Valins National Park, where, as you ascend, the trees are so enveloped by snow that they resemble otherworldly figures; a wintry phenomenon from which this high point’s name – the Valley of the Phantoms – comes. A snow safari around The Zoo Sauvage de St-Félicien allows us to get up close and personal with the animals of the boreal forest, including elk, wolves, musk oxen, deer and even, at a greater distance, polar bears. The intensity of the cold here is not to be taken lightly – you’ll need proper thermals, windproof outers and non-slip snow boots, as well as hats, gloves and even a balaclava. Keep your phone tucked into your layers – the batteries hate the cold and there’s little more frustrating than wanting to take a photo – as you’ll want to nearly every few minutes, because there’s Instagram-worthy wintry beauty in every direction – and finding that your phone has died. The extremes of the climate are perhaps perfectly encapsulated by the Ouiatchouan Falls at Val Jabert: what we see on our visit to this ghostly, abandoned paper mill town is a mass of icicles tumbling in suspended animation down a rock face, but once, an entire industry was run on its force. Stunning and silent in this winterscape, it’s hard to conceive of what a powerful assault on the senses it must be in summer. Summer lovin’ is undeniably appealing, but there’s something about this stillness and whiteness that’s uniquely romantic, in an enchanting, fairytale way. Economy return fares from London Heathrow to Montreal start from £408 per person – aircanada.com. Fares are inclusive of taxes and subject to change.